... and we're back. After a week of feeling sorry for myself, I'm good to go again. How is everybody? I've been busy... sewing. Photos to come. I've also been doing my own ribbon bookmarks, and made my own flavoured lip gloss. It's official, I shall craft for the rest of my life in a house full of cats. At least I'll be surrounded by pretty things. 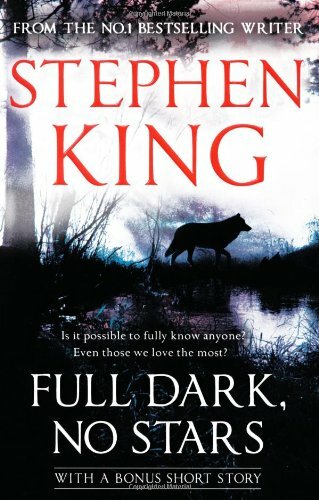 Full Dark, No Stars is a collection of four short stories written by Stephen King. It's the first time I've read any of Stephen King's work (please don't judge me for being a scaredy cat), and I must say, it's a nice introduction. They are mostly crime stories, with the exception of Fair Extension and the bonus chapter, Under the Weather. I have to admit, the bonus chapter was my favourite by far out of all the stories, so please make sure you grab that version if you're planning on buying this book. The first story, 1922, is about a Nebraskan farmer who murders his wife when she threatens to sell their land. It is such an intense story, it left me with my skin crawling for hours after reading it. Big Driver is about a cozy mystery writer who plots revenge after being brutally raped. It reminded me of the movie The Accused in some very small parts. There were some very crazy twists that I did not see coming at all in this story, it was astounding. I found the third story, Fair Extension, slightly disappointing, as I didn't find the ending satisfying enough. A man gets a chance to cure himself from a fatal disease, but only if he inflicts suffering on an old rival of his. The final, and most chilling of all, A Good Marriage, was written by Stephen King after reading an article on a serial killer named Dennis Rader, whose wife was married to him for 34 years and claimed not to have any knowledge of her husband's dark deeds. Full Dark, No Stars was definitely a good read. Thankfully my friend Tyler gave me a copy of Skeleton Crew. 22 more short stories by Stephen King? Yes please. I'm so glad you're back Toni! I missed you! I love Stephen King and this book sounds great. I hope you're feeling a little bit better now. And by the way, I'm planning on doing your something new reading challenge next year! Can't wait. Great to know you're back, Toni! Okay, I must admit, I have not read a Stephen King book simply because I'm scared. I want to sleep soundly at night, too, you know! :-) Anyway, I have to work up my nerve first to get myself to read a Stephen King work even if it involves short stories. I've seen enough dead men in my news reporter days to last me a lifetime, so we'll see... Looking forward again to your reviews! Glad you are back Toni...and don't fear being a crazy cat lady! Just come on and join the club!! I hope to read some King next year...I've been a fraidy cat too!